Ooopsie, I've been super busy with my digital photography side of things, so I've not had a chance to work much on film. 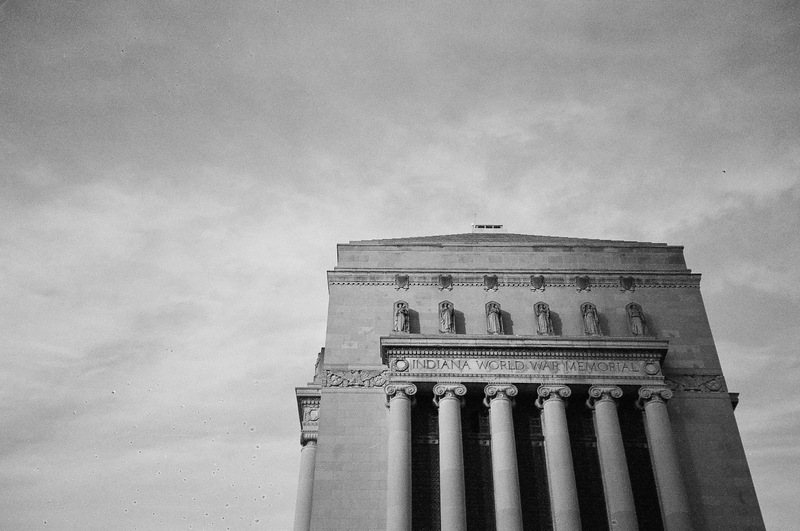 I picked up a couple of rolls today, so I thought I better get back to my blog. Here goes. I purchased a Vivitar PZ3090 point & shoot from Goodwill, and kind of like it. Compact, easy to use and packing a 38-90mm lens. Really good range for a point & shoot. It was clean. It also packs a flash which is very useful for indoor settings. I loaded it up with a new battery and plopped in a roll of Ilford XP2 400 B&W film. The camera was very responsive, and easy to use. Just what you need in a point and shoot. Here's a shot of the Indiana World War Memorial monument in downtown Indianapolis on an overcast day.